My candle obsession comes in waves, and I have the lack of choice and awareness of candles to thank for that. Most of my collection comprises of Bath and Body Works candles of varying degrees of fruity florally-ness. The rest is a perplexing medley of luxury candles that I use sparingly. And after about the hundredth time, lighting up B&BW’s Eucalyptus Spearmint candle, I decided it was time I gathered the old collection together and assess my candle needs. One of my favorite candles of all time is aforementioned, Bath and Body Works’ Eucalyptus Spearmint. Of which, they must have realized was very popular because the last time I bought one, it was in a beautiful frosted glass container. Now it sits in a uniform, rather boring, clear glass container with a metal lid like their other candles. They also have a much larger line-up of products. I found myself somewhat intimidated by all the Eucalyptus Spearmint-scented products and decided I might file away the candle for now. Another of my favorites was a pricy little piece from Diptyque. Their Chevrefeuille Honeysuckle candle brings a smile to my face and a nice, pleasant creamy honeyed scent to the home. I love coming out of the shower and getting a big whiff of Chevrefeuille. What I don’t like is the price tag. At $60.00 for a candle, I find it difficult to even take the thing out and use it most of the time. 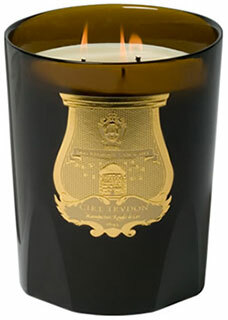 Cire Trudon is another one of those candle makers with beautiful candles and crazy prices. Their Pondichery candle is one of my favorites. Lovely crisp and fresh scent, nice projection and the packaging looks great sitting anywhere. It’s a bit difficult to find their candles unless you head to a higher end department store, and when you do the price tag hurts even more than Diptyque’s candles. What I wouldn’t give for a beautiful, less expensive version of Pondichery or Chevrefeuille. I’m tired of Eucalyptus Spearmint. So if anyone has any candle suggestions, I am all ears! This entry was posted in All, articles, editorial, recommendations and tagged editorial, recommendations. Bookmark the permalink. A couple of inexpensive candles I’ve tried were so awful that I don’t want to experiment with those any longer. And those that were great are so expensive that I’drather spend those money on perfumes. So sorry, no suggestions from me. That’s my dilemma too. The inexpensive candles weren’t that great. And the expensive ones were awesome, but when I look at a candle that costs $60, I honestly would rather spend that money on perfume. Actually, I’m not one for candles, but I do have diffusers all around the house. I find that I like some of the Voluspa scents and I have some old stock Dr. Vranjes prior to them reformulating their Compass collection (the new ones just aren’t as potent). I had not heard of Voluspa, but I went to look and I love the packaging! Which Voluspa candles do you like? Also took a look at Dr. Vranjes and love their packaging too. You find the most stylish things! I went to look online and I obviously bought some that were on closeout because I don’t see them anymore (I purchased them on One Kings Lane ). The one that I like the most is an amber. I don’t see it listed as a product anymore, but they do have a new amber in their lineup. As much as I like diffusers, I typically will not pay full $ amount for them and will purchase via Gilt, One Kings Lane or some other upscale discounted clearance site. I like Yankee Candle’s Sage & Citrus. Thanks for dropping by and leaving a comment, Sunduri. I’ve tried Sage & Citrus and found it to be a little too herbal for me.